What does “Used Margin” mean? In order to understand what Used Margin is, we must first understand what Required Margin is. Whenever you open a new position, a specific amount of Required Margin is set aside. Required Margin was discussed in detail in the previous lesson, so if you don’t know what it is, please read our What is Margin? lesson first. If you open more than one position at a time, each specific position will have its own Required Margin. If you add up all of the Required Margin of all the positions that are open, the total amount is what’s called the Used Margin. Used Margin is all the margin that’s “locked up” and can’t be used to open new positions. This is margin is already being “used”. Hence the name, Used Margin. While Required Margin is tied to a SPECIFIC trade, Used Margin refers to the amount of money you needed to deposit to keep ALL your trades open. Long USD/JPY and want to open 1 mini lot (10,000 units) position. Long USD/CHF and want to open 1 mini lot (10,000 units) position. How much margin (“Required Margin”) will you need to open each position? Since USD is the base currency for both currency pairs. a mini lot is 10,000 dollars, which means EACH position’s notional value is $10,000. Let’s now calculate the Required Margin for EACH position. The Margin Requirement for USD/JPY is 4%. 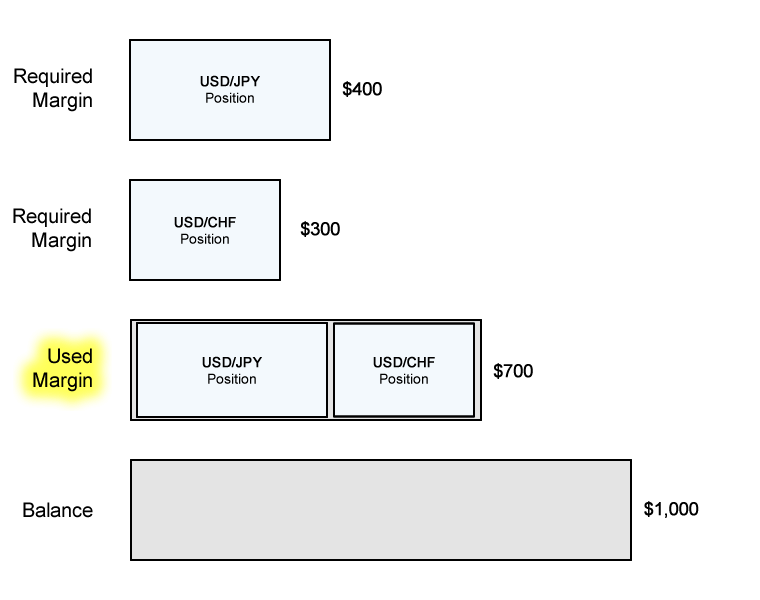 Assuming your trading account is denominated in USD, the Required Margin will be $400. The Margin Requirement for USD/CHF is 3%. Assuming your trading account is denominated in USD, the Required Margin will be $300. Since you have TWO trades, the Used Margin in your trading account will be $700. Here’s a cool diagram of how Used Margin relates to Required Margin and Balance. Used Margin is the TOTAL amount of margin currently in use to maintain all open positions. Said differently, it is the SUM of all Required Margin being used. What is Margin Trading? Learn why it’s important to understand how your margin account works. What is Balance? Your account balance is the cash you have available in your trading account. What is Unrealized and Realized P/L? Know how profit or losses affect your account balance. What is Margin? Required Margin is the amount of money that is set aside and “locked up” when you open a position. Let’s move on and learn about the concept of Equity. Next Lesson What is Equity?